Understand that mobile development is a manageable process that isn’t as radical as you may think. Recognize that mobile applications are ubiquitous, but the hype is not as daunting as it may seem. Use your existing principles when developing a mobile strategy. With many options to choose from, such as Native iOS, Native Android, and React Native, you must develop a clear strategy. Due to consumerization, the mobile device market is controlled by end users. These end users dictate which devices they use, and in what context. Choosing the correct mobile development tool for your organization is critical. Companies should veer from hyped products, and be conscious of future vendor lock-in with proprietary tools, which do no integrate with current development standards and practices. Understand the entire ecosystem of native apps, being cautious of the complications that can come with developing an Enterprise Application Store (EAS). Organizations should develop web apps to avoid code fragmentation and long-term maintenance and version complexities that can arise from side-by-side web and native app development. Native apps should be considered when specific hardware features, like cameras or contacts, is essential to application functionality. Tool selection for native apps should remain simplified. The pervasiveness, and fragmentation of mobile devices leads to challenges, and opportunities for mobile app development. The large number of different mobile devices has created a high level of fragmentation, yet users expect the same features and experience across platforms, and form factors. The mobile development market is not as mature as desktop and web. Mobile applications require a sound strategy to guide a development team forward without introducing unnecessary risk that locks users into a platform that may not be supported in the future. Even within a single platform, upgrades are not always backward compatible. This introduces risk in redevelopment efforts. Mobile applications are an excellent way for businesses to engage with customers and employees. They are designed so that a single task can be completed anywhere, at any time, making them extremely appealing to users. The different form factors and platforms each have specific features. Businesses can build use-cases for these different features, and create mobile experiences that satisfy the majority of end users. Developing a right-size mobile strategy is necessary because there are implications across the development stack. Without a sound strategy, requirements will spiral into a wish list of unnecessary user, and technical requirements that serve no purpose to the business. This wastes precious resources, and capital on development that has no ROI. Over time, useful applications tend to see increased take up. Without a governing strategy, the mobile application will eventually bloat into its own team, and processes that may not utilize existing infrastructure and processes. Left unchecked, integration of two development silos at this stage becomes extraordinarily difficult, and expensive. A lack of strategic mobile development focus will result in problematic apps. 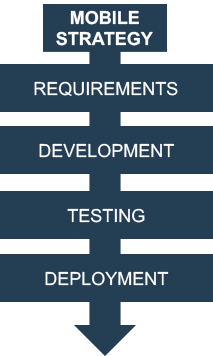 Organizations will struggle with uncontrolled requirements testing. Mobile development techniques are not radically new. They are a natural evolution from desktop to laptop, and now into mobile and tablet form factors. Therefore, the same principles that apply to traditional non-mobile development still apply, such as requirements gathering, development practices, testing, deployment, and maintenance. Organizations must have a very clear mobile development strategy to avoid plunging existing development practices into chaos. An ad hoc mobile development approach can pull away critical resources, and funds from other projects. Failed mobile development projects can be costly, but a solid strategy will keep people, and processes aligned for mobile development success. Mobile development is governed by three dimensions: form factor, platform, and application. Organizations should understand the pros and cons of choosing where to play in this space. Choice of mobile development tools is critically important. Organizations should stay away from the hype, and be careful about future vendor lock-in with proprietary tools, which do not integrate with current development standards and practices. Mobile web apps will provide the greatest long term flexibility for organizations as compared to native mobile apps. Organizations should develop web apps as a default to avoid code fragmentation, and long term maintenance, and version complexities. Native apps should be considered only if local hardware features are required in the app functionality. It is imperative to continually measure your success. To do this, measure the usage of your apps amongst your users, and request feedback. This will really help is in mobile app development process.